Upon arriving at GM, Ed Whitacre gave Henderson his qualified support. In two years, Ed Whitacre has gone from running the largest U.S. telecommunications company to the largest U.S. automaker. And the new interim CEO of General Motors Co. has used his reputation as a bulldog and deal maker to do the job. Whitacre, 68, was named chairman of GM's board of directors in June, replacing interim Chairman Kent Kresa. On Tuesday he said the board had accepted Fritz Henderson's resignation as CEO, and Whitacre will fill the position until an international search for a new leader is completed. Most recently, Whitacre was CEO of AT&T and its predecessor companies from 1990 to 2007. He retired after seeing the largest U.S. telecommunications service provider through seven large acquisitions over a decade. The Texas-born executive, who spent 44 years with AT&T, was the telecommunications industry's best-known deal maker. His biggest was AT&T's $86 billion acquisition of BellSouth Corp in 2006. Most sources who know Whitacre had described him as supportive of GM. Since the company emerged from federal bankruptcy protection July 10, Whitacre had made several visits to GM's Detroit headquarters and its Warren, Mich., technical and design offices. He didn't just chat up the top brass, insiders said. He would conduct what some call “diagonal slice” meetings, talking with everyone -- from midlevel managers to lower managers to salaried employees -- and demanding action. In another hands-on move, Whitacre appeared in GM's “May the Best Car Win” television commercials earlier this year, saying in the spots that at first he had doubts about the company. 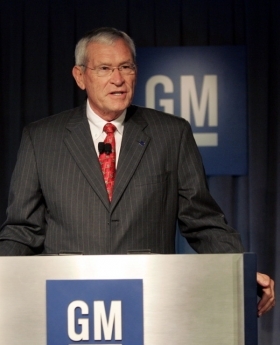 Whitacre told Bob Lutz, GM's vice chairman in charge of marketing and communications, to spend the money necessary to communicate the company's viability and product strength to the world. Whitacre urged the creation of an attention-grabbing campaign. For now, he's also the new guy in charge. In announcing his new position today, Whitacre said two of his top goals for the company are profitability and repaying government loans. “Yes, we have a profitability plan, and we're going to get there,” he said in August. Whitacre also serves on the boards of ExxonMobil Corp. and Burlington Northern Santa Fe Corp. He holds a degree in industrial engineering from Texas Tech University. Jesse Snyder and Reuters contributed to this report.